Today, non-invasive body contouring options are more plentiful than ever, and many have found that it can help them meet their goals for fat removal with minimal disruption to day-to-day life. But even after reviewing the basics of these procedures, it is still very easy to be overwhelmed by the variety of techniques now available. We’ve compiled the essential information in a comparison of 5 of the most popular non-invasive fat reduction techniques available today. Considerations Individuals sometimes need to be wrapped in blankets, given warm beverages during treatment to avoid being chilled. Must be accompanied by significant diet, exercise and water intake. Results are more minimal compared to other treatments. Varies between treatment types Recovery time is more substantial, and highly dependent on individual pain tolerance and healing. Follow-up visits are needed to ensure proper healing. The only treatment that doesn’t require downtime or recovery time. A review of the range of options demonstrates that there are some commonalities across the major non-invasive fat removal treatment types. Namely, multiple treatments are usually necessary to achieve desired results. Yet the treatment time/duration and the number of recommended treatments—and therefore the time commitment and cost of each procedure—can vary a great deal. 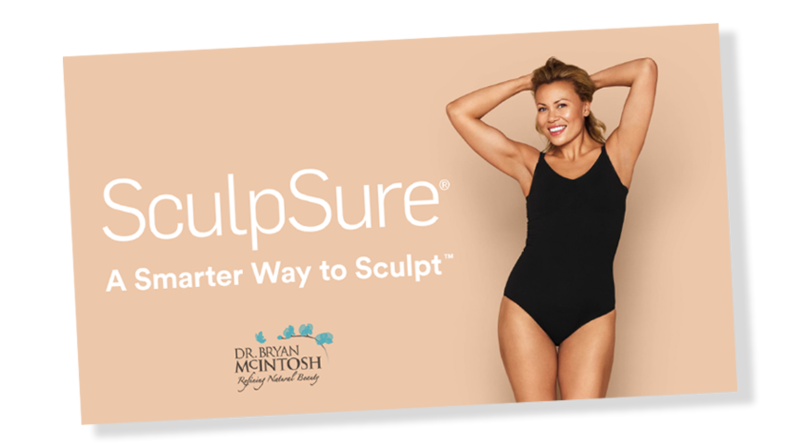 SculpSure’s body contouring technology is able to safely target and destroy fat cells in just 25 minutes per treatment area, helping you achieve a slimmer appearance. See more before and after photos from previous patients who tried SculpSure. Results may vary. How do I decide which option is best for me? The best way to determine which treatment option is right for you is to consult with a Board Certified Plastic Surgeon, such as Dr. Bryan McIntosh, who will provide you with a personalized treatment plan, and whose staff will assist you in every step of pre-treatment, the procedure, and recovery.